Thyme for Cooking spring vegetables, Asparagus with Lemon and Olive Oil. 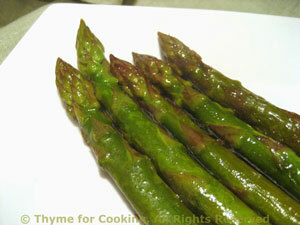 If the green asparagus is thick, peeling will help it cook faster and even the stalks will be tender. I always peel white. A quick dressing of olive oil and lemon lets the fresh asparagus shine! Snap off ends of asparagus. If white use vegetable peeler and peel the bottom half of stalk, laying it flat to peel to prevent breaking. Lower heat and cook just until done, 6 - 10 minutes, longer for white. When done drain and put into a serving dish, drizzle with olive oil and lemon. Add salt and pepper if desired and serve.